The Battlehammer fellas showed off their Urban Manhunt goodies and discuss the game as well on the newest edition of Monthly Mumble. It starts at 2:52, but as I always say, you really should watch the whole episode, as it's just THAT entertaining! 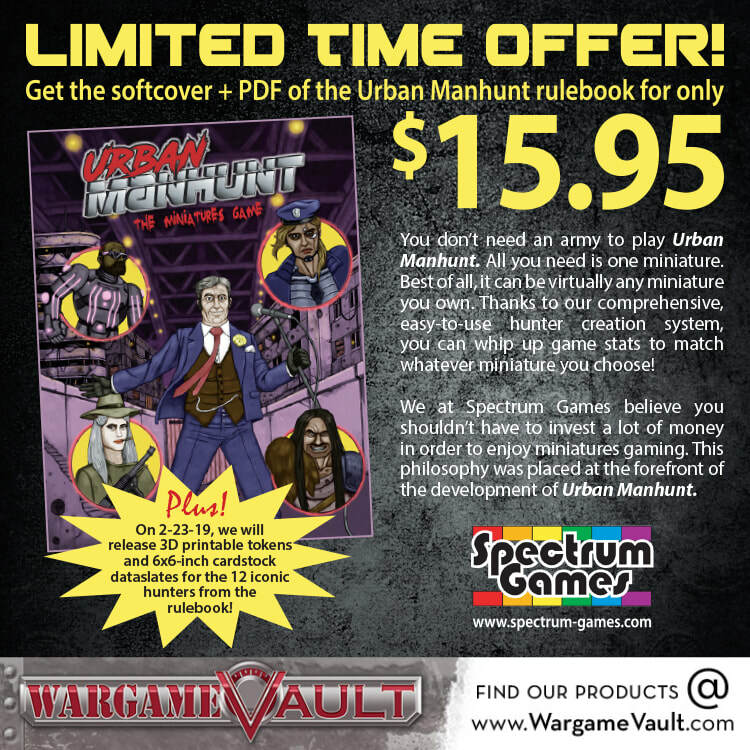 Urban Manhunt PDF Rulebook for $5.95! [Cartoon Action Hour: S3] Huge St. Patrick's Day Sale -- 40% Off! To celebrate St. Patrick's Day, we are offering a 40% discount on all our Cartoon Action Hour: Season 3 PDF products. You'll find find supplements written by industry pros John Wick, Shane Hensley, Matt Forbeck, Steven S. Long, Eddy Webb, Jason L Blair, Rob Wieland and newcomer Mark Lungo. If you love 1980s action cartoons and want to bring them alive at the game table with your friends, this sale is the perfect chance to do so! But don't delay. The sale ends on Sunday, March 24. Click here to take advantage of this sale. The Urban Manhunt Card Collection is here! 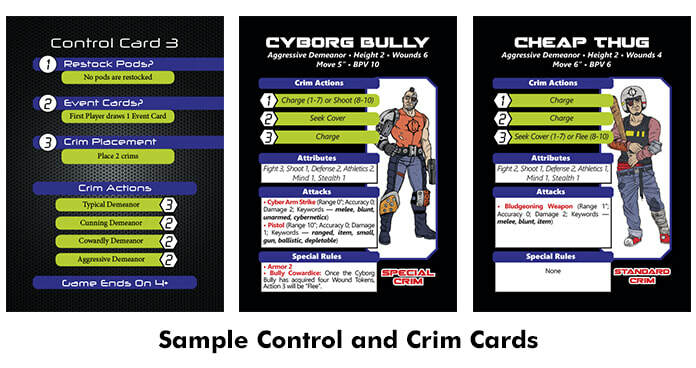 You can purchase the Control and Crim Cards here. Two New Urban Manhunt Products Available Now! Spectrum Games has released two new products for Urban Manhunt: the Miniatures Game. 3D TOKENS: Use your 3D printer to produce all the tokens and markers you’ll need for Urban Manhunt, including the First Player token, Wound tokens (marked “1” and “3” for in-game convenience), Momentum tokens (marked “1” and “3” for in-game convenience), Item markers, Hidden markers, Empty markers, and Reload markers. You can purchase the 3D Tokens here. ICONIC HUNTER DATASLATES: The stats for all 12 iconic hunters from the rulebook are presented on 6-inch by 6-inch sturdy color cardstock tiles. You can purchase the dataslates here. 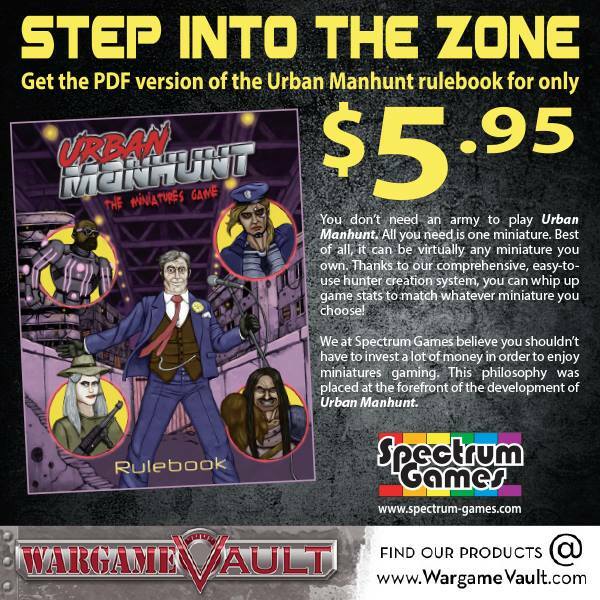 The Urban Manhunt softcover rulebook is here! Urban Manhunt on "There Will Be Games"
Urban Manhunt now has an entry on "There Will Be Games". Check it out and please give us a rating if you have an opinion on the game. You can find the page here. Urban Manhunt uber fan Nicolai Østergaard has posted a really cool blog entry that I'd like to share, as most of it works much like a review of the game. It's a fun read too, with lots of pics of his miniatures. ​Click here to check it out.